I gave this to my mother for her birthday. She loves it so much, she wears it all the time. Be fashionably ontime with this watch thatfeatures a black dial with a Rushmore illustration and decorative 12k Bl;ack Hills Gold leaf detailing. Powered by a precise Japanese quartz movement for any occasion. 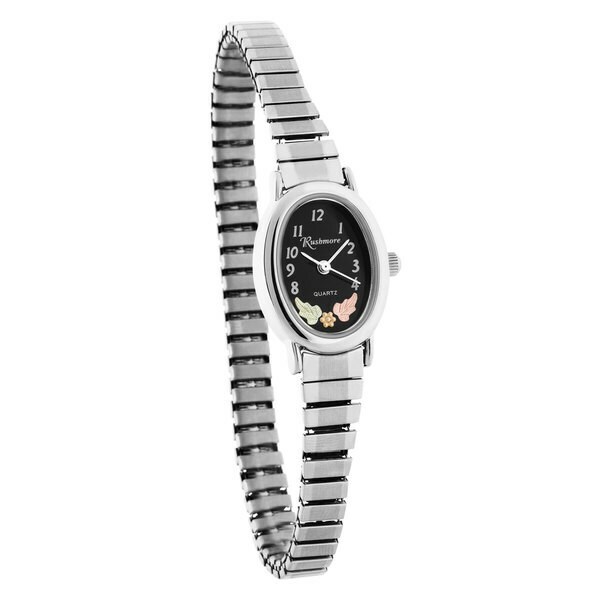 I purchased this watch for my mother for her 91st birthday. She loves Black hIlls gold and she was very happy with this watch. It's beautiful. Love my sweet little watch! It is exactly as shown in the photo and matches my new black hills silver wedding bands my husband and I bought while in the Black Hills. Update 12/22/18: First one quit working and overstock immediately sent another one and I just sent this one back to them. Love the watch but because I have a small wrist it is too big and not only slides up and down my arm but also around my arm. So I'm ordering the same watch but with the black band so I can adjust it on my arm. Super cute, very lady like and dainty. Looks nice with any outfit. Love the metal stretch band. Arrived early, very happy with this ladies watch. Love this watch and the details on it. This product is durable and attractive. I love this watch very classy looking and water proof.I wish the face was bigger but I love it. I wanted a black face to read the face easier this is lovely. The band is comfortable. This watch is beautiful and very comfortable to wear. Very happy with my purchase. The band was too large and no way to have it adjusted at the jeweler. "will it fit 6 in wrist"
This can be sized to fit 6.5 to 7.5-inch wrists.